Every year, as it gets to be winter and the days get shorter and shorter, bath time at our house seems to get longer and longer. In the summertime, we are usually playing outside when I all the sudden look at the time and rush everyone in for a quick dinner/bathtime/bedtime. In the winter however, it gets dark so early I feel like dinner/bathtime/bedtime drags on. 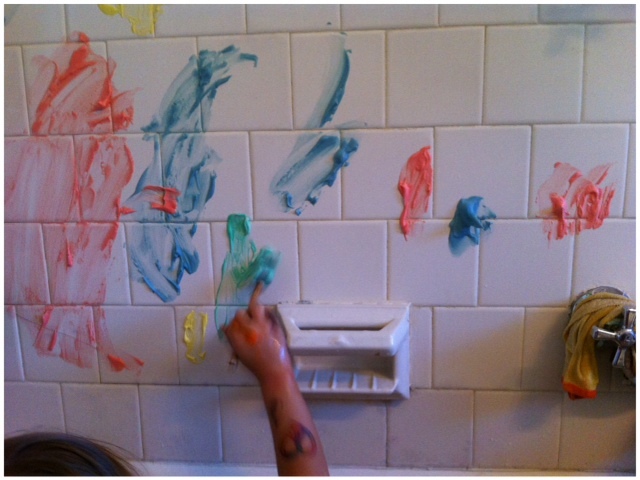 Last winter, we started taking advantage of a longer bath time by making our own bathtub watercolor paints. A solution that made the girls very happy to go get into the bathtub. So I was happy to get back to some bathtub painting this year but though we might try a new kind of bathtub paints using shaving cream. I have had this idea on my pinterest board for a long time and it is so quick, simple and fun I can't believe we didnt do it earlier. Basically, all you need is a muffin tin, shaving cream, food coloring and paint brushes. Fill each cup in the muffin tin with shaving cream, the Bee loved this step. Add about 20 drops of food coloring to each cup and stir with a spoon until the color is fully mixed and voila! 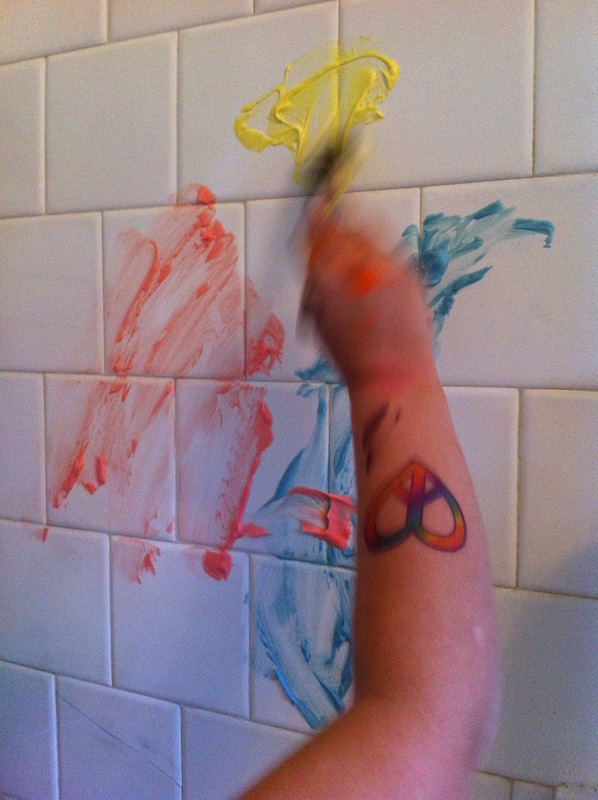 We used some inexpensive foam brushes which work perfectly. The Bee and Bean painted and painted then they washed the wall down and painted some more. After a while they used all the paint and the water was getting cold. So we wiped off the wall, drained the tub, refilled and went on with our normal bath routine. The girls loved this so much we have already done it 2 other times and it seems to be a very good motivator for getting everyone inspired to go up and take a bath!